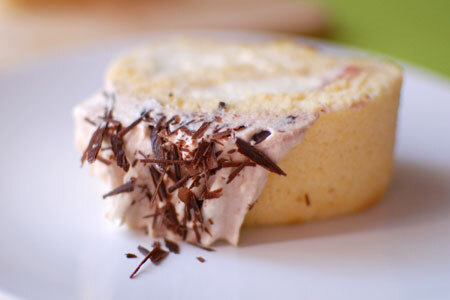 Soft and fluffy, simple cake − rolled up with whipped cream and strawberry jam, topped with cocoa cream and chocolate. As the sponge is baked in thin, flat square, it cooks & cools down quickly. It only takes 1 hour to make! You can add fresh fruits inside the roll, but today I just made it simple. Separate egg yolks and whites. Add 1/2 of sugar to the yolks, and whisk until creamy and pale colour. Shift in flour, and mix until just combined. Add a pinch of sugar to egg whites, and whisk until fluffy. Add remaining sugar gradually to form a stiff peak meringue. Add 1/3 meringue to the yolk mixture. Mix well. Repeat with remaining. Spread the mixture onto lined tray. Tap lightly to release any air bubble inside the mixture. Bake for 10 minutes. Leave to cool. Peel off the baking sheet, and place the sponge on a piece of clean baking paper. 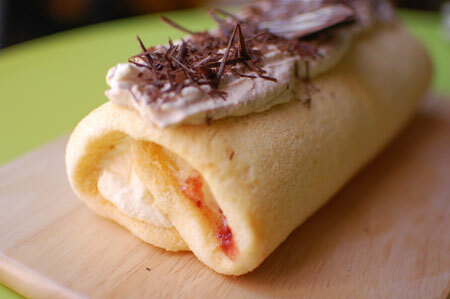 Spread 1 tbs of strawberry jam & whipped cream, then roll up using the baking paper. Chill in the refrigerator before slicing. For topping; mix whipped cream with cocoa powder. 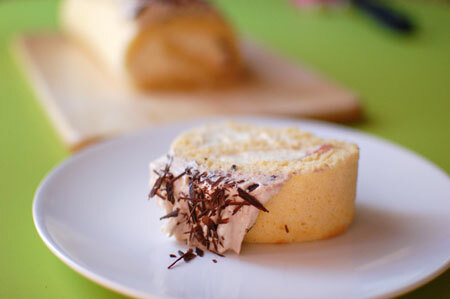 Spread on top of rolled-cake.